Norcross, GA — Hayes Microcomputer Products, Inc., announces the Hayes Stack™ Chronograph, an RS-232C compatible calendar/clock for small computers. The Chronograph is the latest in the Hayes Stack series of stackable microcomputer component systems. Featuring quartz-crystal control, the Chronograph adds the dimension of precise time-keeping to computer systems. With the Chronograph and user-developed software, a computer can log programs and reports by day, date and time. Utilizing the computer alarm feature, the Chronograph can also provide a computer with information necessary to control lights, burglar alarms and sprinkler systems. 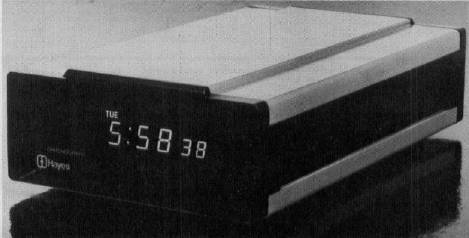 To cut the cost of electronic mail, the user can combine the Chronograph with the Hayes Stack Smartmodem and a computer, then develop programs to batch messages during the day and send them at night when telephone rates are lowest. The Chronograph is a standalone unit in an aluminum case with a large, easy-to-read display for time, date and weekday reporting. The display also features low battery, write-protect and alarm indicators. The Chronograph reports the time in hours, minutes and seconds in 12- or 24-hour modes. The date is output in a year, month, day format with automatic leap year adjust, and the weekday is output as a single digit, 0-6. Because it is powered independently, the Chronograph does not need to be reset when the computer is turned off. The Chronograph also features a battery backup to maintain time, date and weekday for up to a year when the power fails or is disconnected. For added protection, a write-protect switch on the rear panel of the Chronograph prevents accidental changing of the time and date. The user controls the Chronograph through a command set of simple ASCII character strings. These commands allow the user to set, read and display calendar and clock data, control the computer alarm and select various options. Other features include 300 or 1200 baud operation and automatic baud rate, parity sense and word size detect. The Chronograph system includes the Chronograph unit, power pack, 3 AA batteries and complete owner's manual. It is covered by Hayes two year limited warranty. The suggested retail price is $249.00. For further information contact Hayes Microcomputer Products, Inc., 5835 Peachtree Corners East, Norcross, GA 30092.